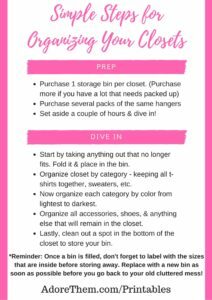 I decided to share a few of my closet organizing tips that have become a way of life for us now. 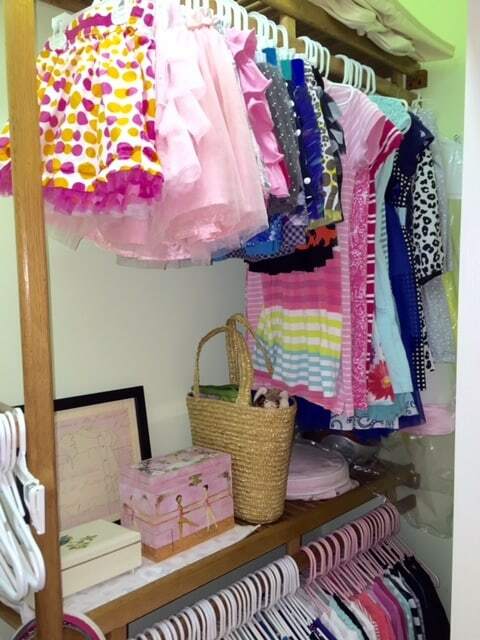 For some reason it was much easier to keep my children’s closets organized and filled with age appropriate and current sizes when they were babies. Every couple of months (or weeks during growth spurts) I would take out the 3 month clothes and replace them with the 6 month and so on. But once my kids got into the toddler sizes, 2T, 3T and so on, clothes seemed to stay until one day, while getting them dressed in a hurry, I would realize the shirt simply wouldn’t fit over their growing head and their pants looked like they were preparing for a flood. 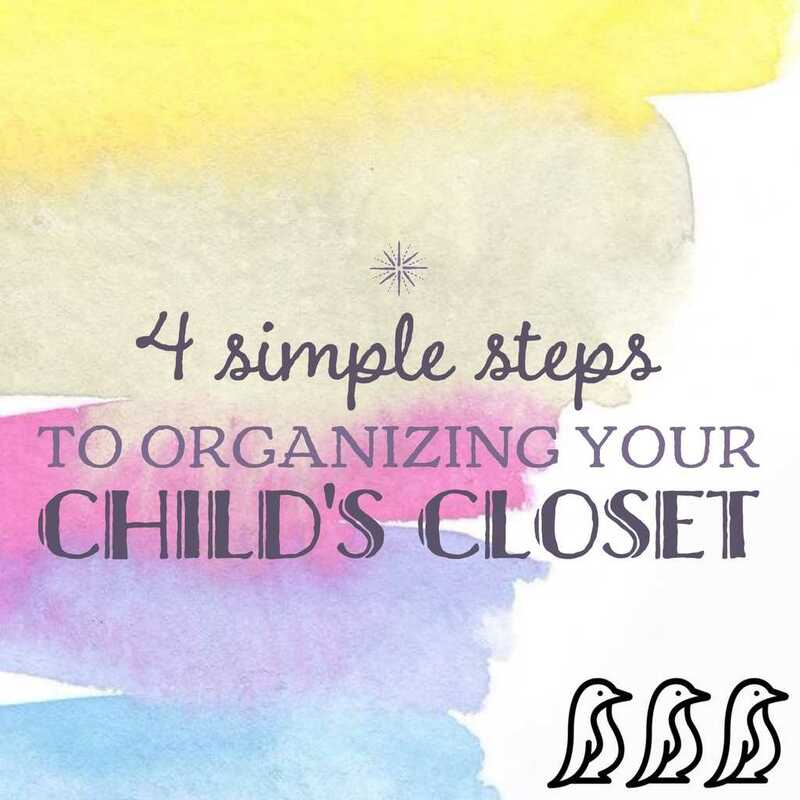 I used to then throw these clothes in piles all over the house with the intention of quickly carrying them down to the basement, folding them in neat little piles and placing them in nice labeled bins correctly marked with each size. This way when a garment doesn’t fit, you can simply place it exactly where it belongs – folded in the storage bin. Once the bin is full you can print out a nice label (or throw a post-it note inside) that lists the sizes in the container and place the bin in the basement or attic. (Tip: I like bins with lids – then kids seem less likely to pull things out again. Also, if they are sturdy it doubles as a step stool so that they can reach the top clothing rod). 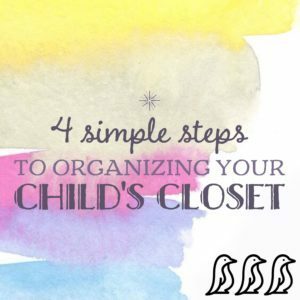 I find this makes getting dressed much easier and quicker for my kids because all of their T-shirts are always hanging together. All of their skirts are together, dresses, and so on. It really only adds a few extra seconds when hanging up their laundry, but is well worth the extra effort. I like how much time it can save from searching for that certain top that matches those hot pink shorts my daughter insisted on wearing this morning. This really can make the world of difference! Having every shirt hang at the same length in the same direction and with the same amount of bulk is truly a must! For my kids I buy packs of the same plastic hangers at target for only a few dollars. For myself I splurge on nice velvet hangers from Costco. 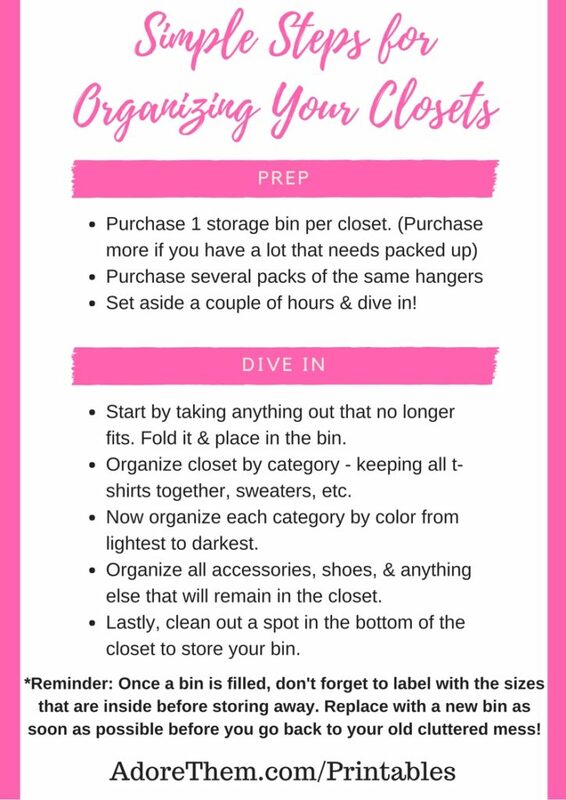 If you are lucky enough to live in an area that experiences several or all 4 seasons, then you may want to consider moving your clothes depending on the weather. In the summer time I place t-shirts first, but in the winter I switch their position with sweaters. But no matter what is hanging where, they will still always hang in order of color. 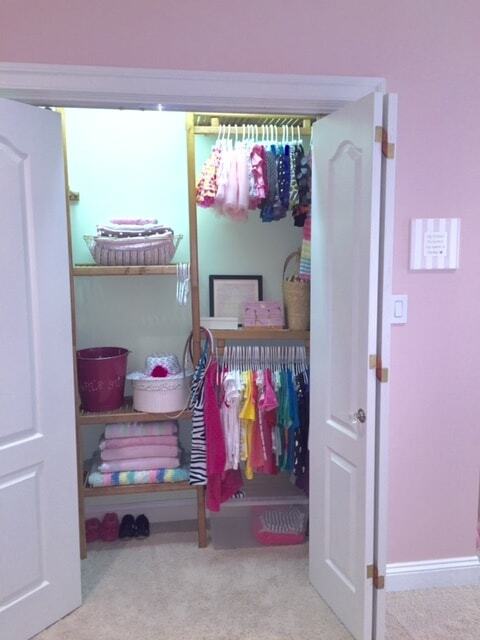 Here is an actual picture of my daughters closet in the middle of the summer. My daughter only keeps her slippers and fancy shoes in her closet. The rest are downstairs in our closet by the front door. Above her shoes I keep some thicker blankets for fort building, or incase she gets cold at night and decides to layer up. Above the blankets is a bin that we keep all of her hats in, and in the smaller bin is her favorite china tea-set that is off-limits to her little brothers. 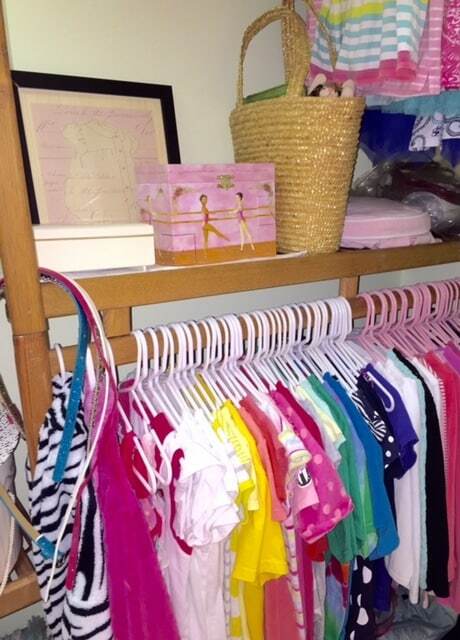 On the top shelf I have a wire basket with all of her swaddling blankets that we used when she was a baby. She loves when I get these down and we wrap up her dolls and stuffed animals. I also hang from here all the extra hangers. Under her clothing I have the storage bin and her duffel/travel bags. Hanging up top I have all of her skirts and dresses. Below I have her jewelry boxes and a “quiet bag” filled with some special toys that we take to church, restaurants, and other events where she will need to sit quietly. Beside that is just an extra cushion for a stool in her room, and a little CD player. On the bottom rod I have her belts, bath robes, gymnastic leotard, and then all of her t-shirts, cardigans and long sleeve shirts.